One of the reasons I thought Tom Brady's Deflategate suspension wasn't as bad as some people were making it out to be was because the world got a close look at backup Jimmy Garoppolo, albeit for a game and a half. 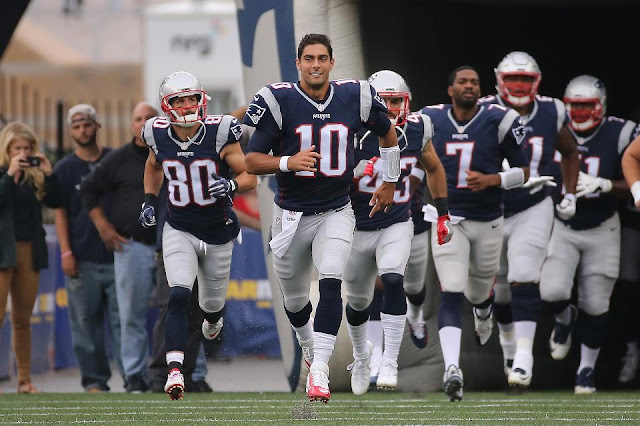 But in the limited time he played, Garoppolo showed the ability to move in and out of the pocket, make throws under pressure and build a rapport with his targets pretty quickly. All of this drew special attention to the Cleveland Browns. The Browns, for about the 78439674890267th time, are looking for a quarterback, and Garoppolo is apparently on their radar. Cleveland has the No. 1 pick in the upcoming NFL Draft, so they could draft a quarterback. But many experts have said this draft class is full of weak quarterbacks, which is a reason Garoppolo could be enticing to them. The Patriots definitely wouldn't be able to pry the top pick away from Cleveland, but the Browns also own the No. 12 pick, which would definitely be attractive to the Patriots. Given that Sam Bradford, an average quarterback at best, was able to net Philadelphia a first-round pick before this season began, there's no reason the Patriots can't acquire at least that from someone whether it's Cleveland or someone else.